It took over 1,000 years to gather the religious leaders of the many Eastern Orthodox churches in one place, and still, when it happened, not everyone was in attendance. The week-long Holy Great Council, in the pipeline for 55 years, was supposed to bring together all the congregations of the Eastern Orthodox faith. But as the bishops gathered on a Greek island on June 19, some last-minute cancellations cast a shadow over the summit. The head of the Russian Orthodox Church, Patriarch Kirill, was the last and most high-profile of the four religious leaders to pull out of the historic pan-Orthodox summit. To explain the cancellation, Moscow cited the absence of three other churches, also last-minute drop outs: the patriarchates of Bulgaria, Georgia and Antioch (based in Syria). More likely, however, was that the Russian refusal to attend was based in politics rather than theology. Geopolitics, after all, have prevented Orthodox bishops from uniting since their last meeting in the year 787. Politics undermined the council even before it began. There was controversy over the summit’s location, originally planned for Istanbul, the former city of Constantinople and the birthplace of Eastern Orthodox Christianity. Bad relations between Russia and Turkey made that location impossible, so Patriarch Kirill’s Constantinople equivalent, the ethnic Greek Patriarch Bartholomew, agreed to change the location to more neutral territory: Crete. Everything was done so as not to antagonize the Moscow delegation. But in the end, Russian priests never made it to the island. And the reason they pulled out of this once-in-a-millennium council lies in Kiev. Even before the Maidan revolution tore a rift between Kiev and Moscow, Ukraine’s Orthodox believers were far from united. The Ukrainian church split in 1992: Part of the country’s parishes broke away from Moscow’s authority and formed the Kiev patriarchy of the Orthodox church. The current head of the Kiev Patriarchy, Patriarch Filaret, has stood at the front of a drive to recognize Ukraine’s independent religious authority ever since his appointment in 1995. But the political and military conflict between Russia and Ukraine increased the animosity. The Kiev patriarchy sided with the Euromaidan movement from the start. The Ukrainian capital’s St. Michael’s Monastery symbolically opened its doors to protesting students when the violence first erupted in December 2013, protecting them from riot police. It served as a sanctuary for the injured during the bloodshed that followed in February 2014. The Ukrainian Orthodox Church of the Moscow Patriarchy, meanwhile, had close links to the Viktor Yanukovych regime, as well as a history of cooperating closely with previous presidential offices. During the subsequent conflict in eastern Ukraine, a large number of the parishes of the Moscow patriarchy backed separatist rebels. This cost the Moscow patriarchy many worshippers in Ukraine. The leaders of 10 Orthodox churches stand for a portrait at the Orthodox Academy of the Greek island of Crete on June 17. 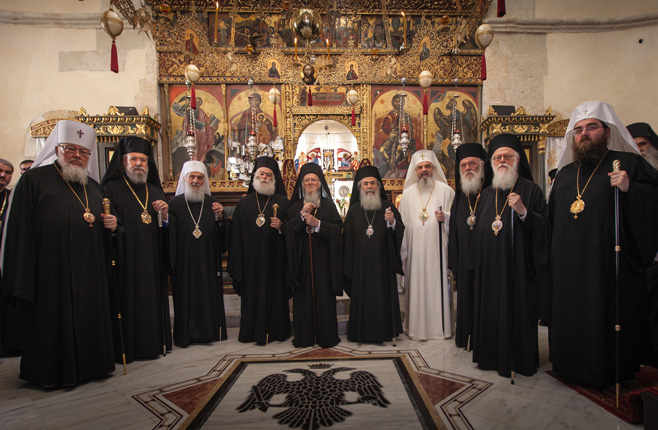 The Orthodox Christian leaders met in an effort to promote unity. Some of Ukraine’s parishes remain loyal to the Moscow patriarchy — perhaps as much as 20 percent of Ukraine’s religious population. Given the breakdown in communication between the two countries, support is now growing for the Ukrainian Orthodox Church to break away from Moscow’s authority altogether. On the eve of the Crete summit, the Ukrainian parliament urged the church to act, appealing to Patriarch Bartholomew to recognize the independence of the Ukrainian Orthodox Church and to take it under Constantinople’s wing. They argued that this was Ukraine’s historical right: Before being transferred to Moscow by Tsar Michael I’s decree in 1686, Kiev was originally under Constantinople’s authority. “They want to switch back, and that’s within their right,” argues historian Andrei Zubov. But the stakes are high for Moscow. “They cannot allow this at any price,” says the theologian Andrei Desnitsky. The Russian Orthodox Church, he says, sees itself as the sole leader of Eastern Orthodox Slavs. Losing Ukraine would mean losing thousands of parishes. After the Soviet Union collapsed, the Russian Orthodox Church had more active parishes in Ukraine than in Russia. The Russian Orthodox Church could thus be almost halved as a result of such a change, says Zubov. Ukraine’s ambition for a religious divorce from Russia threatens to rekindle a centuries-old rivalry between Moscow and Constantinople. Before the congress, Kirill warned Bartholomew that any steps to separate Ukraine from his authority would lead to deterioration in relations. The two churches agreed to keep the issue off the agenda at the summit, providing the Russians turned up. Even though the Russian delegation was absent, no changes were made to the Ukrainian church’s authority. Patriarch Bartholomew did, however, accuse Moscow of prioritizing national interests over church unity during a speech at the summit. The Russian Orthodox Church sees itself as the sole defender of Christianity against the “barbarians” in the East and the “decadence” of the West. Patriarch Bartholomew has the most authority of all Orthodox clerics, but Moscow sees Constantinople as a tiny quarter in Istanbul, representing an empire that no longer exists. By contrast, Patriarch Kirill controls much of Moscow’s post-Soviet empire and represents 130 million of the world’s 300 million Orthodox Christians. Leadership rivalry may well have pushed Patriarch Kirill to snub the Crete meeting with the intention of undermining Bartholomew’s authority. Ultraconservative circles inside the Russian clerical elite also see Patriarch Bartholomew as the leader of a dangerous, pro-Western stream of Orthodoxy. The hardliners inside the Russian Orthodox Church made their position clear when they were presented with documents of the questions scheduled to be discussed in Crete. 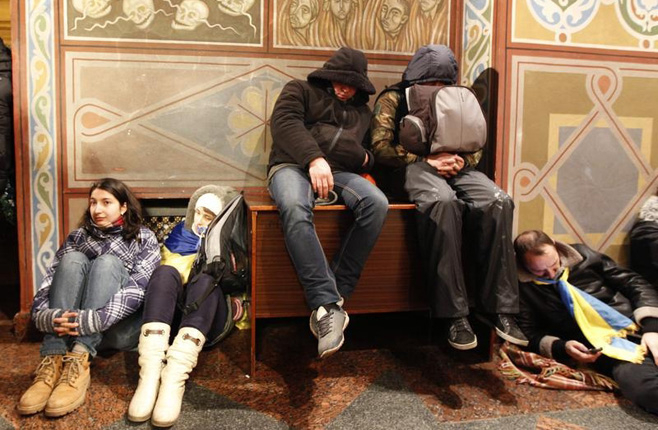 Protesters rest in Kiev's Mikhailovsky Zlatoverkhy Cathedral on Dec. 1, 2013. After police used batons and stun grenades on pro-Europe protesters, about 10,000 of them regrouped in Kiev. 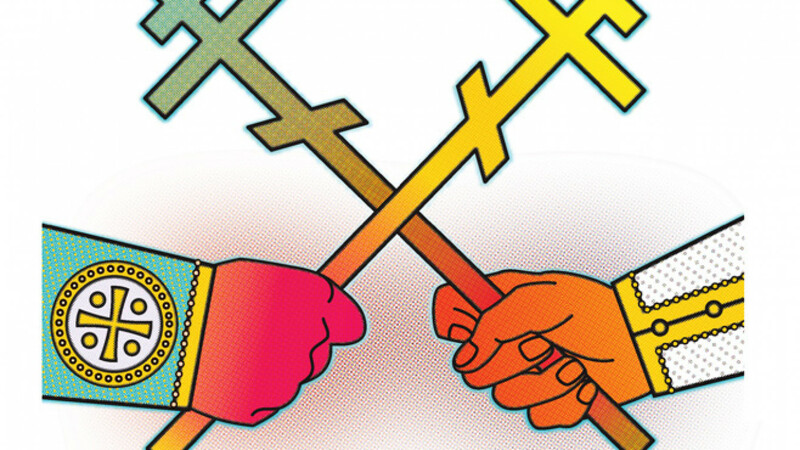 Among these was the “intolerable” issue of allowing marriages between Christians of different congregations and the proposed reversal of a resolution that ruled Catholics and Protestants were heretics. A scheme to allow the use of modern languages in preaching, as opposed to ancient tongues such as the Old Slavonic used by Russian Orthodox priests, was also a step too far. The documents confirmed suspicions of Russian Orthodox bishops toward Patriarch Bartholomew: He is ready to work with Western Christians. For them, any agreement with other Orthodox churches ready to recognize Western churches as equals is unacceptable. Staunchly anti-Western, they were unhappy when Patriarch Kirill met with Pope Francis in a Cuban airport lobby in February. “The Patriarch was pressured by his own elites to snub the meeting,” says Andrei Zubov. The fundamentalists inside the Russian church have been growing in strength in the current political climate. The Russian Church has played an active role in promoting the Kremlin’s nationalistic propaganda and confrontational rhetoric with the West. Patriarch Kirill enjoys a close relationship with President Vladimir Putin: Just recently, he joined him on a trip to Mount Athos in Greece. The links between the Russian state, security services and the Russian Orthodox Church have come under particular scrutiny. This close relationship goes back to the Middle Ages, save for some time between the 1917 revolution and 1943. Toward the end of World War II, Stalin reversed the repressive Soviet policy toward religion by allowing priests to preach under close state supervision. According to Desnitsky, the Russian state gains much more than the church in the bargain. But there are few dissenting voices within the church. “There’s no opposition, nor is there likely to be,” says Desnitsky. That is something the independently minded deacon Andrei Kuraev knows only too well. He is one of the few who have openly criticized the church leadership. Kuraev says many bishops will be unhappy about the Russian church snubbing the Crete summit. “We should have done what the Serbs did,” he says, noting that the Serbian Orthodox Church initially announced it wouldn’t attend and then changed its mind. Patriarch Kirill, it seems, has chosen politics over unity. But walking away may cost his increasingly secluded church dearly.